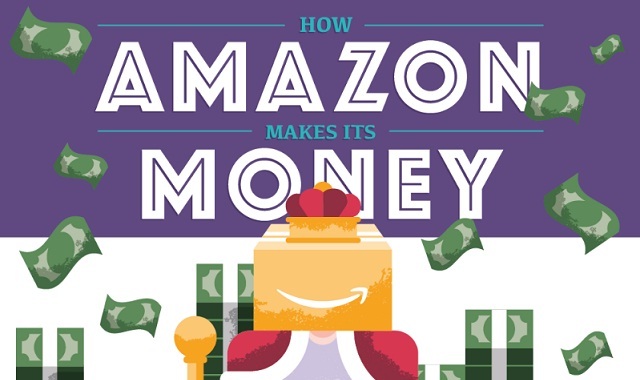 How Amazon Makes Its Money #infographic ~ Visualistan '+g+"
From humble beginnings, Amazon is just about as old as the Internet itself. Amazon turned online shopping on its head and arguably shaped the way retail business is conducted online - but how did it get there? E-commerce grows every year, putting more and more traditional retailers out of the job in the process. The Amazon market value is at a whopping $427 billion (that’s billion with a b) compared to the $291.5 billion combined market value of eight other leading retailers. Besides the endless Prime orders, how has Amazon become one of the top retailers in the world? To understand Amazon’s success, just follow the money; Amazon has never stopped innovating. Just as the Internet has grown and changed with the times, so too has Amazon. Today, the Amazon we interact with is very different from the product it began as. It has since expanded to a cloud computing giant - a pioneer of smart home devices, a movie studio, and e-book publisher.